Where: The Light Centre Belgravia, 9 Eccleston Street, London, SW1W 9LX. A three hour offering to tap is into the Solar practice of AcroYoga. Focussing on partner acrobatics and inversions this workshop will work progressively, getting you strong in your physical body and building on your mental well being allowing you to try things that may seem impossible and making them possible. We will working on strong foundations, precise body actions as well as boundaries to create human shapes and transitions that involve bases, flyers and spotter. This is an open level session and participants are asked to have a regular bodywork practice, a willingness to work with others and have an openness to be challenged to achieve their fullest potential. 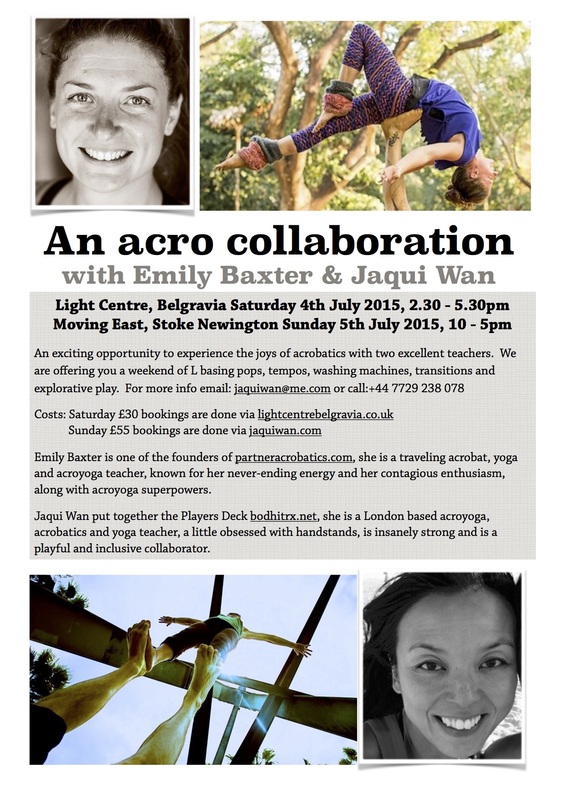 An exciting opportunity to experience the joys of acrobatics with two excellent teachers. We are offering you a weekend of L basing pops, tempos, washing machines, transitions and explorative play. The day would best service experienced acroyoga and acrobatic practitioners. We advise a pre requisite of both star (shoulderstand of feet) as well as reverse star or momo limb reverse star. There will be a one hour lunch break, please bring your own lunch. Emily Baxter is one of the founders of partneracrobatics.com, she is a traveling acrobat, yoga and acroyoga teacher, known for her never-ending energy and her contagious enthusiasm, along with acroyoga superpowers. Jaqui Wan put together the Players Deck bodhitrx.net, she is a London based acroyoga, acrobatics and yoga teacher, a little obsessed with handstands, is insanely strong and is a playful and inclusive collaborator.